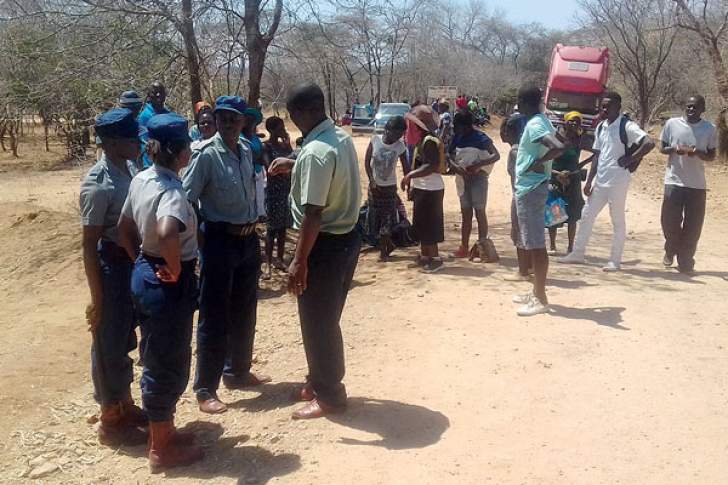 THERE was chaos and near clashes on Thursday in Hwange's Mabale ward after former councillor Spiwe Mapfuwa diverted a truck ferrying inputs for the Presidential Inputs Scheme to a Zanu-PF base, resulting in a standoff with villagers. It is alleged that Mapfuwa, a former Hwange Rural District council chairperson, who lost to Joseph Bonda (MDC Alliance) in the just-ended election, diverted the truck to the Zanu-PF base. However, Bonda and villagers who had assembled at Mabale business centre, intercepted the vehicle as it was driving into the base. Tempers flew as Mapfuwa, who had also organised her supporters in a bid to stop the truck from leaving the base, blocked the road before threatening Bonda and supporters with violence. "It's fortunate that the volatile situation did not turn violent as Mapfuwa's supporters had surrounded Bonda and his people at the base, which made them vulnerable. The atmosphere was charged, with accusations of corruption being traded between the feuding parties," one village head, who was called in to diffuse the situation, said. Bonda said he had to mobilise people in order to stop the politicisation of inputs, which had characterised the former councillor's reign, who argued that only Zanu-PF sympathisers should benefit from national programmes. "What happened is quite pathetic. The people who are no longer in authority should give way to those that have been bestowed with the mandate to serve the people. The former councillor does not want to accept that she is no longer in charge and has, on several occasions, got me into trouble, including getting me arrested in an effort to get rid of me," Bonda said. "This time around, she was at it again. We intercepted a truck which was ferrying fertiliser for the Presidential Input Scheme at a Zanu-PF base. So we said as the new council, the distribution was going to be apolitical, something that Mapfuwa was opposed to." He said they later agreed to park the truck at Chief Nelukoba overnight. "It took us some three hours to bring the truck to the distribution centre after she barricaded the roads with branches and stones. This surprised us since the chief had authorised the truck to go to the business centre, where people were supposed to get their allocations freely and fairly," Bonda said. He said police details watched helplessly as Mapfuwa refused to move the barricades from the road. "We later proceeded to the centre, where army and GMB [Grain Marketing Board] personnel, and village heads aided in distributing the inputs fairly, something that has not happened in 20 years," he added. Bonda said they received 535 bags for distribution to Dopota, Sianyanga and Lupote. "So, maybe some bags were removed while the truck was parked at the base before we arrived," he said. Chief Nelukoba-Dingani confirmed the standoff, saying he had to intervene before the situation turned violent. "I was actually surprised when this truck came to my homestead without my knowledge, with people suggesting that it was fair for it to be parked there overnight following a disagreement over the place of distribution. At first, I refused as I feared violence would break out at my homestead. Eventually, after getting assurances, I agreed and looked for men to guard the consignment so that none of the feuding parties could access it." The traditional leader slammed Mapfuwa's politicisation of the donations and called for fair distribution of presidential inputs and urged her to accept defeat. "I implore both Mapfuwa and Bonda to find common ground and work together for the good of the people," he said. Chief Nelukoba added that following the incident, he had since resolved that no politician would be involved in the distribution of government food aid. Hwange West legislator Wesley Tose, in whose constituency the ward falls, has often complained over the partisan distribution of the presidential inputs. During distribution, Southern Eye observed that buyers from as far off as Harare, Bulawayo and Chinhoyi had descended on the area to sweet-talk villagers into selling their fertiliser. A 50kg bag was fetching $10 and some of the impoverished villagers were falling prey to the unscrupulous buyers. Mapfuwa could not be reached for comment. Matabeleland North Zanu-PF chairperson, who is also the Provincial Affairs minister, Richard Moyo, lambasted both Zanu-PF and MDC Alliance members who fought for control of the inputs. "Both of them were wrong in fighting for something which does not belong to them. Things have since changed. The inputs must be distributed by the Grain Marketing Board, Agritex [Agricultural Rural Extension Services], with the assistance of the community and the police," Moyo said. He said politicians must not interfere with government programmes.